I used the Watson Bra pattern by Cloth Habit and the Virginia Legging pattern by Megan Neilsen to make a new activewear set! I plan to wear this set to yoga classes along with a shirt, but here are some photos to show off my handiwork. The Virginia Leggings came together quickly because there are only three pattern pieces. I made the high-waisted version in under an hour. I used a serger for all steps of construction, did a roll hem on my serger instead of hemming with a zig-zag stitch. I have my eye on a coverstitch machine (Bernina L 220), and I plan to hem them with a coverstitch eventually. The fabric is a kaleidoscope-printed nylon/lycra fabric purchased two years ago from thefabricfairy.com. Bra notions were purchased from Erin at The Emerald Studio on Etsy, and of great quality! The elastic I purchased, both picot edge and strapping, has better recovery than what is typical on RTW bras. And, I hope you follow Erin’s lingerie sewing blog, Emerald Erin, or you are missing out! She always has some gorgeous bra eye candy! And, she is hosting a giveaway right now that ends Sunday! I modified the watson pattern by using swimwear elastic on the neckline to make it look a little more like a sports bra than a bralette. I still used picot elastic on the hem and underarm though. I also used two layers of fabric in the cups for some extra compression since I’ll be wearing this to workout. Dad, if you are reading this, you might want to stop reading now because I am going to talk about bra sizing (your welcome). Yes, he reads my sewing blog, and yes, he IS the best dad ever! First, let me say thank you to the ladies that have reviewed this pattern before me. Thank you for having the courage to post the bra selfies of the projects that didn’t fit (or any bra projects at all for that matter)! Your reviews with pics saved me so much time by helping me find the correct size to make! I am sharing the following information to “pay it forward” to other sewists who may share my same measurements. Like others that have made the watson, sewing the bra in my RTW size fits better than the size the pattern recommended based on my measurements. Also, the band size seems to run a little small. First off, I am always a 32 band size (and always on the tightest set of hooks) and either a C or D cup in RTW, but the Cloth Habit sizing guide suggested I should make a 30D. Since others said the band ran small, I made the 32 band size, and still, it is very snug. The middle row is ok for working out, but I use the loosest hooks when I am going to be wearing it for more than an hour. On me, the front cradle piece is not long enough, so the side seams are too far forward as demonstrated by my lovely dress form. The side seams on the bra should line up with the side seam on my dress form. The I think once I add 3/8″ to each side of the front cradle piece, the back will close with more wiggle-room (literally). For the cup sizing, I was torn on what cup size to make so I printed out the pattern pieces for the front cradle in the 32C and the 32D, glued them to card stock and held the stiff pattern up to myself like I was fitting underwires for a wired bra. 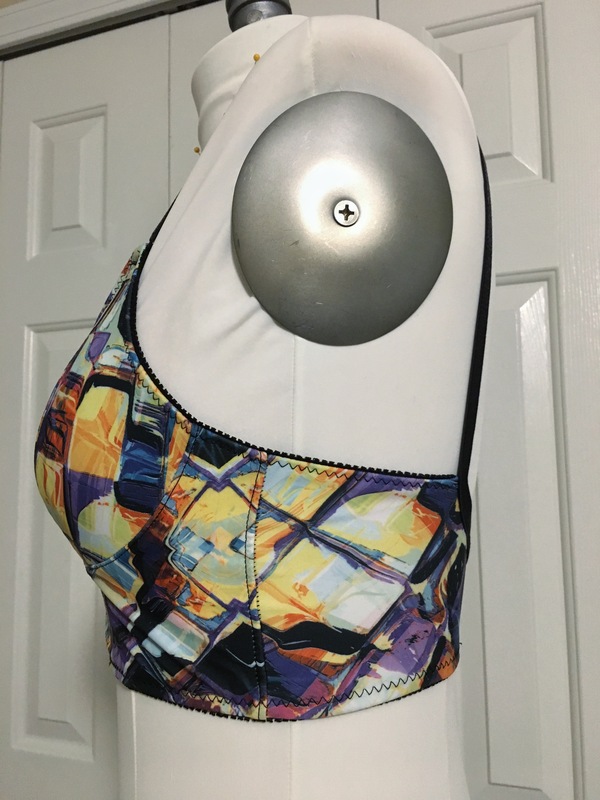 If you decide to do this, keep in mind the 1/4″ seam allowance is present and the diameter of the cups will be slightly narrower on the pattern than the finished bra. Besides the sizing dilemma, it is a really great pattern and worth tweaking until you get it right! It is as jiggle-proof as a sports bra but with more definition than the “sports bra uniboob” look. Ha! I am eager to make another Watson Bra with only one layer of fabric in the cups to see if there is a dramatic difference in support. And a big thank you to my friend Rheney for taking these photos!